"Pope Francis (@newsva) spoke in Spanish to the crowd gathered outside the @uscapitol earlier today, offering a prayer for children and reaching out to nonbelievers by urging anyone who felt they could not pray to simply send good wishes. The #pope drew a huge roar from the thousands gathered simply by saying, "Buenos días!" 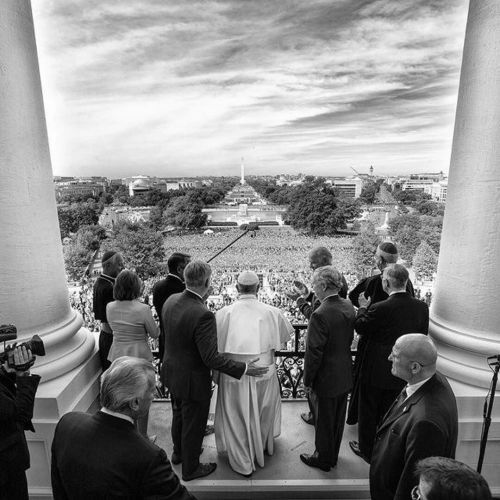 #regram from @nytmills, one of the @nytimes photographers covering the #popeindc. Follow @crowleygraph, @zachgibson5, @gdemczuk and @ericthayer to see more." By nytimes on Instagram.